1. Learn as much as you can – You will learn a ton of information by actually training for and participating in the food challenges and eating contests, but you definitely want to learn as much as you can before you really get serious so that you don’t make a ton of unnecessary and potentially dangerous mistakes. You now have a very reliable source to learn from. I will be the first to admit that I don’t know everything there is to know, but I have learned a lot since starting in 2010. All of my experiences and things that I have learned through trial & error are documented throughout all of the over 100 articles featured in the TIPS and STRATEGIES sections. If you have questions about something food challenge & competitive eating related, there is a very high chance that your question is covered throughout one of the articles which are all labeled with very descriptive titles. If you can’t find the answer, please make sure to contact us, and then I can answer it in a future article. You are probably not the only person with that question, so you will help all of us by asking it so that I can include the answer on the site. Check out all the articles and use that information to better yourself and improve both your training regimen and strategies, along with your techniques. Then you can better help other people in the future so we can continually pass on helpful information. Way too many people are failing challenges simply because they don’t know what to do. A smarter community will lead to significantly greater, positive results in the future. 2. Share articles and information that you find helpful – Not only will this help us, but it will also encourage potential eaters & fans to get interested and involved with the community. There are millions of competitive eating fans that don’t even know they are yet. Some of those people may be in your “social media circle” and need you to spark their interest. One of the keys to our success is to start driving more traffic to the site. People can’t get involved if they don’t even know they can or where to go. The reason that there are no real competitive eating sponsors is because nobody even knows how many people are interested because there is no central place for people to go to join and follow, which then shows off the total number of people following the sport to potential sponsors. By sharing an article or page, people will click on it, and then have the chance to check out other parts of the site. Just get people to check out one page, and we will do our part to make sure they stay for a while. A larger base of followers means more potential for larger opportunities, which is what we all want!! 3. Promote small local businesses!! – If you get on YouTube and check out eating videos, you will more than likely find a bunch of videos of people eating foods from McDonald’s, Taco Bell, In-N-Out Burger, Wendy’s, Burger King, Pizza Hut, and other big-name corporate fast food restaurants. These people are doing this not only because the food is cheap, but also for YouTube views, which definitely attract more views than posting eating challenge videos (trust me, I know from experience). While it is okay of course to do food stunts like eating chicken nuggets and Big Macs every now and then, know that these corporate restaurants will never see your videos, care that you are doing them, or ever sponsor an eating competition any time soon. There would be no food challenges or eating contests if smaller restaurants were not hosting them, so we need to thank these restaurants by promoting their businesses so that they can keep their doors open and continue offering the challenges and contests that they do host. By doing this, other restaurants will take notice and create a food challenge or contest too that you will be able to compete in. That is how we grow the community, by helping the small businesses around us that host eating competitions rather than the large chain restaurants that don’t. 5. Actively promote the community & eating – The most fun and productive way to #FeedTheMovement is to simply compete and participate in eating events. If there are competitions around you, attempt the food challenges and compete at the contests!! Promote the event via social media and encourage people to come beforehand, and then post the results afterwards to further promote the event and how you did. Chances are high that many of your friends & followers will take interest in what you are doing. It is rare to see positive and fun posts via social media these days, so give people something fun to follow. Pictures and posts involving food tend to get more social interaction than other posts. If you are at a smaller restaurant that doesn’t have a challenge, mention the idea to the owner or manager. Many restaurants have pondered the idea, but just have not been coaxed into actually starting a challenge. Your suggestion might just inspire them to create one!! Make sure to tell them to check out our PROMOTERS section to find out exactly what they need to do to be successful. After seeing one of your posts, a friend may ask questions or take interest in trying a challenge too. Recommend articles to them that answer their questions, and tell them to join the eating community so that we can grow!! 6. Use the resources on FoodChallenges.com – One of the easiest things you can do to help us and yourself is to use all of the applications and resources available through our website. We did not design the website with ourselves in mind, and we created it for everyone to use and benefit. We will only be promoting active members (everything is free) of the community so make sure that you have set up a legitimate profile to show off your eating achievements (challenge & contest wins). Make sure to also link your social media accounts and/or your personal website if you have one. Remember to post pictures of your challenges and events too so that people can follow you!! Not everyone following you on Facebook, Twitter, and Instagram will really care, but all of your FoodChallenges.com friends definitely will!! Lastly, include links to your best YouTube videos if you have any so that people checking out your profile who don’t know you will be able to watch some of your events. We will use and cycle each video listed by our members as a #videooftheday via our daily social media posts. In addition to the social media platform, make sure to take advantage of the forums too. Feel free to post questions and comment on other people’s questions or posts. More activity in the forums shows potential sponsors and advertisers that there is a high level of interest which makes them more inclined to join in!! Your user profile is meant to serve as your “eating resume” to fans and promoters, so please let us know how we can improve it. 7. Have fun and CARE!! – People love to do things that are fun, and they might want to join in on the fun if they see you having fun. Who doesn’t love having fun eating food? Soon, we will have FoodChallenges.com apparel available to wear so that you can proudly represent and support the community at your eating events. When wearing FC clothes, wear them proudly and have fun!! If people see you having fun, they will be more likely to check out our site to see what the fun is all about. Also, show people that you truly care about what you are doing. If you don’t care about the results of your food challenge or eating contest, why should anybody else? If people in your “circle” know that you care and are passionate about what you are doing (eating), then they will be more likely to support you online and at local events. As the community really starts to build and gain momentum, more challenges, contests, and opportunities will begin to become available. Since you were working hard and improving as part of the community already, you will be able to proudly capitalize on those opportunities while knowing that you were one of the initial people that helped get the “movement” started. 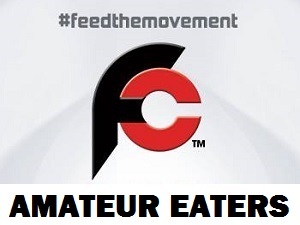 Thanks for reading “How Amateur Competitive Eaters Can #FeedTheMovement” and using our website! !